Check out the new web site called Action on Sugar. This action group of experts in the UK are fighting the health problems of over-eating sugar. With news reports such as How sugar is killing us...and we are not told the risks making around the world headlines we know the problems of sugar consumption are more far-reaching than dental decay. An article in the Daily telegraph in Dec 2013 says that people who consume less than 5 % of their calorie intake from added sugars have far better dental health. While fluoride can help with minimising decay it doesnt eliminate it. Cutting back sugar consumption will not only help prevent decay but it will also help with reducing diabetes and heart disease. 'Caries' is Latin for 'rot' or rotten. 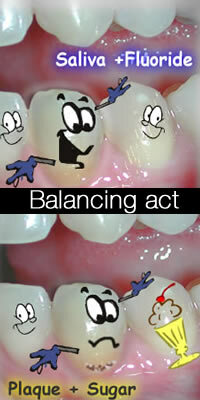 A high rate of caries activity in the 15-30 year age group. A high rate of caries activity in the elderly, including coronal, root surface and recurrent caries(these are holes near the gum line or around old fillings). Increased risk of caries among individuals that are medically compromised, or with some physical disability. Whether or not you get dental decay depends on a constant contest between factors that result in tooth destruction and factors repairing the damage. Each time we eat we can cause demineralization (loss to the hard material that make up the tooth) and this loss of good minerals can be limited and quickly reversed by our saliva and fluoride. If the damage is not repaired then micro-holes(very small holes that you can't see with your eyes) occur and as this continues cavitation (a hole) that can be detected either by the dentist or the patient will occur. Regular dental check ups will help detect early decay â€“ either before cavitation (HOLES). Should I wait until I have pain? No, smaller holes are easier to repair successfully and much cheaper to treat. Cleaning your teeth is important but you can't clean your teeth well enough OR often enough to counter the effect of high sugar eating. Frequent eating of high sugar content foods, often combine with high acid foods (that saves the bacteria the job of converting it! ), provides excellent environment for tooth exposures to pH at erosive levels.